There happens to be a wonderful shop attached to our hotel. 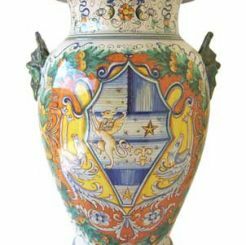 Sabbia Talenti offers exquisite Italian Majolica ceramics and ships special orders to customers all over the world. 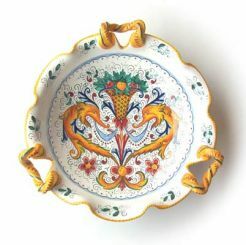 The hand-painted dinnerware is incredibly charming. Where to put my new vase? Wow, this looks like shops in Italy! Love the vase you picked out, looks great there. I love the set of four seasons plates, I would have to bring those home. 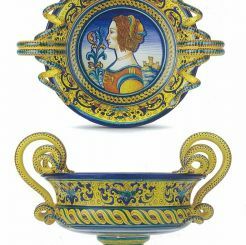 I have a bowl with two handles and very similar to the bowl in the next to last photograph, purchased in Sorrento. Thanks for the shopping trip, brought back sweet memories……….. I love this pottery and always have. 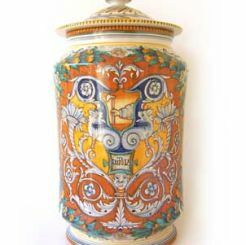 It is timeless and always evokes beautiful memories of Italy, San Gimignano.